American Plastic Toys: My Very Own Cozy Comfort Kitchen! Here is a cute kids kitchen that is light on price and big on detail and fun for the kids this season! Your little ones will wake up to a fabulous kitchen, with utensils, pretend phone, fridge, oven and microwave and little play sink area and more! So much more that this is a nice little modern-style kitchen that is up to date and perfect for little cooks everywhere - light-up burner and all! Recommended for children aged 3 and up, I think it is big enough for kids up to about 4 or 5 years old, but great play for all ages and my kids both are happy with it and they are 2 and 4 years old, respectively. My daughter (4) is going to outgrow it soon, but it will last a couple of years for the 2 year old! 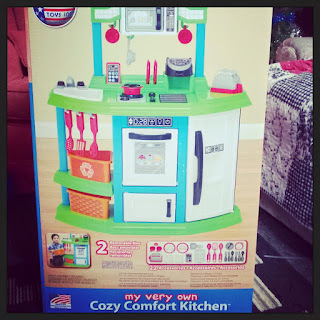 I have gone through a lot of toys over the years and for the cost, this kitchen is a good deal and I would pick one up, again. I would watch smaller children with the pieces and I would stop older kids from leaning all over it, but other than that, it is a great fit! You can buy these at Walmart and good toy stores across the country and there is still time to buy in time for the holidays! I'd love to hear your experiences with this kitchen!